I know we have had our share of rich, indulgent foods this past week....well, at least I know I have. I ended my stint this past weekend with some made from scratch cinnamon rolls. This might be one of those recipes you just put in the back of your head and make sometime in mid February, once the food coma from the holidays is well past. Still, at 9 points+ for a VERY LARGE roll, warm from the oven, I couldn't think of a better way to use up some of those extra points we get each week for just this sort of thing! If you choose to frost it, it will cost you an additional 3 points+. I originally found this recipe at the KAF website, but changed it up a bit to meet the ingredients I had on hand. I was pretty happy with the result. 1. In a 4 cup glass measuring cup, add water and milk. Add the 3 TBS sugar and stir to combine. Whisk in the yeast and allow to sit for 5 to 10 min. 5. After dough has risen, punch it down, and roll out on a greased surface ( cooking spray works well ) Roll out to a 16" x 12" rectangle. Combine the filling ingredients in a small bowl. Brush the surface of the rectangle with the skim milk. Sprinkle evenly with the sugar, brown sugar, flour mixture. Starting at the long side, roll up, firmly but not too tight. Pinch the seam where the dough meets to keep the dough together. 6. Now you should have an approx 16" roll. Cut it in half and then cut each half again and then again with a serrated knife in a back and forth motion. You now have 8 cinnamon rolls. 7. Spray a 9" x 13" glass baking dish with cooking spray and arrange the rolls in the pan so they have a bit of room between each. Cover with plastic wrap sprayed with cooking spray and allow to rise...about an hour. 8. Preheat oven to 375 degrees F. Bake rolls in oven for about 25 - 30 min or until they are brown around the edges and beginning to turn golden brown across the center. 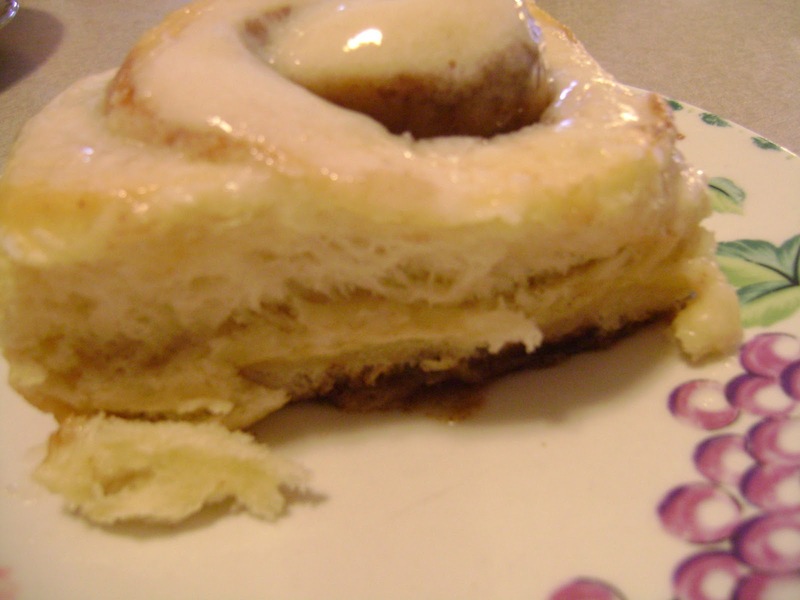 If frosting , combine frosting ingredients and drizzle over the rolls when they are done. These look SOOOOO decadent!!! And worth 11 points. Thank you for posting this recipe.. Look so yummy..
Wow, these look incredible. Happy Monday! I love KAF!!! I use their white whole wheat in just about everything I make. These look amazing.